Our weekly guide to what’s on is full of exclusive interviews and news on the latest shows. 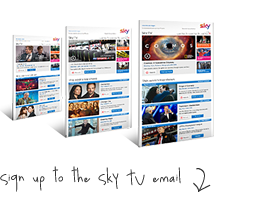 Existing customers Introduce a friend Left Sky in the last 12 months? Go behind the scenes and see how TV is made. Free, and open daily at The O2, London. Sky Backstage is our exclusive bar behind the main stage, free for Sky customers and their friends. If you've pouted and posed for our paparazzi, you can download your photos and relive the moment right here. Enjoy fully immersive Virtual Reality content from Sky VR that makes you feel like you are actually there. Start your night in style in our exclusive bar behind the main stage. Download your photos and videos from Sky Studios and Sky Backstage.